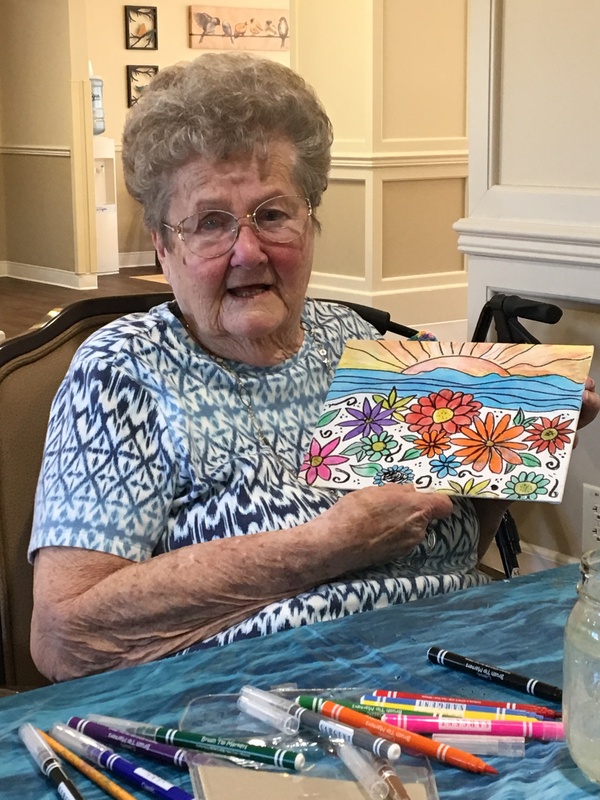 If you are following my blog, by now you know I’ve fallen in love with this simple painting class I facilitate at my mother’s assisted living home. I didn’t want to do it. I did it for her. But the joke is on me because I’m crazy about this class — and these women. I know my friends probably get tired of hearing me talk about it. Because I do, every chance I get. It just seems to come up in conversation — or should I say, I bring it up in conversation. Either way, it’s what I’m talking about these days. I feel so blessed at this point in my life to find a hobby, ministry, pastime, (whatever you want to call it) that I’m passionate about. Some may think I write about this class for my own benefit — nice fodder for a blog. And to be completely honest, it is quite fun to have something new and exciting to write about — something that has become a passion for me. But that’s not why I journal about this class. I write about this class so that you, my readers, get to know these women. I place their pictures here so that you get to see their smiles. You see, it’s not really about me at all — or even the art, for that matter. I want you to see the sparkle in their eyes, the smile on their faces. Each week, I encourage them to share slices of their lives so I can pass their stories onto you. Often they are focused on their painting, and the room is quiet. When chatter erupts, I take in every word. I always have my camera ready, hoping to capture any sweet moment. They have something to look forward to — they really do like this class. I try to keep the projects simple so they are not overwhelmed with the challenge — after all, the class is for their enjoyment. I make the projects timely so that each week, they go back to their room with a finished product. They have something new to talk about with family and friends. How many times have you visited an elderly relative and the conversation is the same as last time you visited? 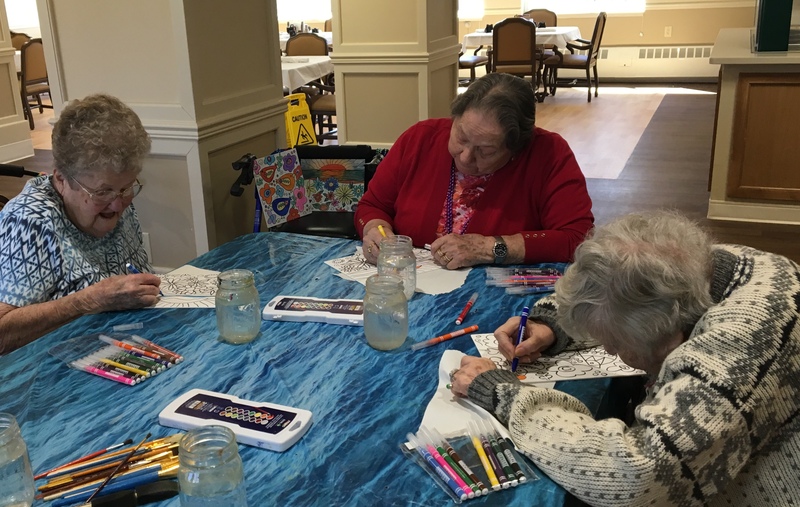 These residents have a new project each week — there is always something new and interesting in their room to talk about. They have a feeling of accomplishment. They are so proud of their artwork, and they should be. Doing anything that requires tedious hand movements and keen eyesight is challenging for them. I love that they are brave enough to come to class and paint. It has given me an avenue to know them. I am an introvert. I would not step out of my comfort zone to get to know these people if not for this class. I would go in, visit my mother, and go home. This class has let me into their lives, and I am so grateful. It has given you an avenue to know them too. And that, dear friends, is why I write about this class. Not for me. Not for my blog. But so that you can see these women as I do. They matter to me, and I want them to matter to you. Say hello to Phyllis. She grew up in the Sturgis area, and graduated from high school here. She left the area soon after that, and has lived in chicago and St. Louis. She recently made Sturgis her home again. My mother and Phyllis have known each other since high school. 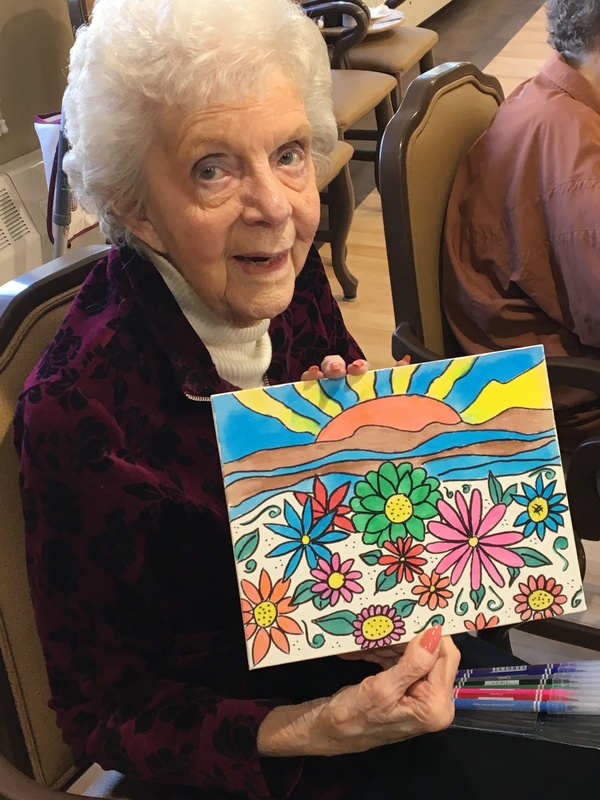 Phyllis is thrilled that her right arm is no longer in a cast and she can paint with it — she first came to class and painted left-handed! This is Alice, my mother. She grew up in Sturgis, but lived in LaGrange and Howe most of her adult life. 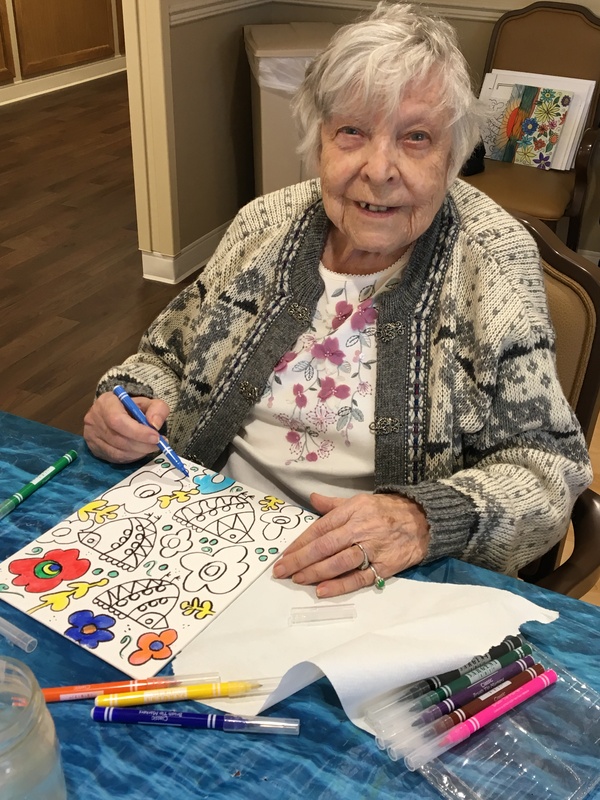 She has always been rather creative, and has gained the nickname of MacGyver Alice due to her “do it herself” projects around our home, but only in recent years taken an interest in art classes. Roberta always wears a hat as the lights in the building hurt her eyes. 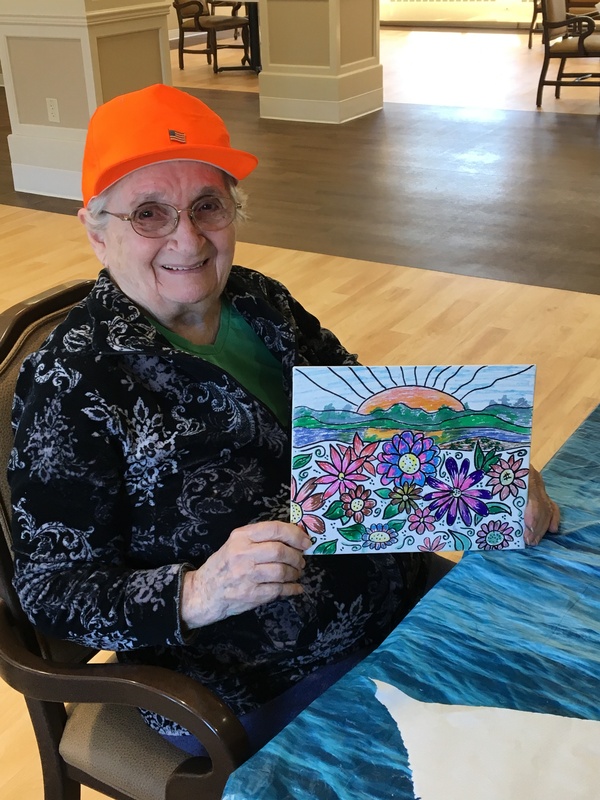 Roberta loves to paint, and is fearless about the blank canvas. 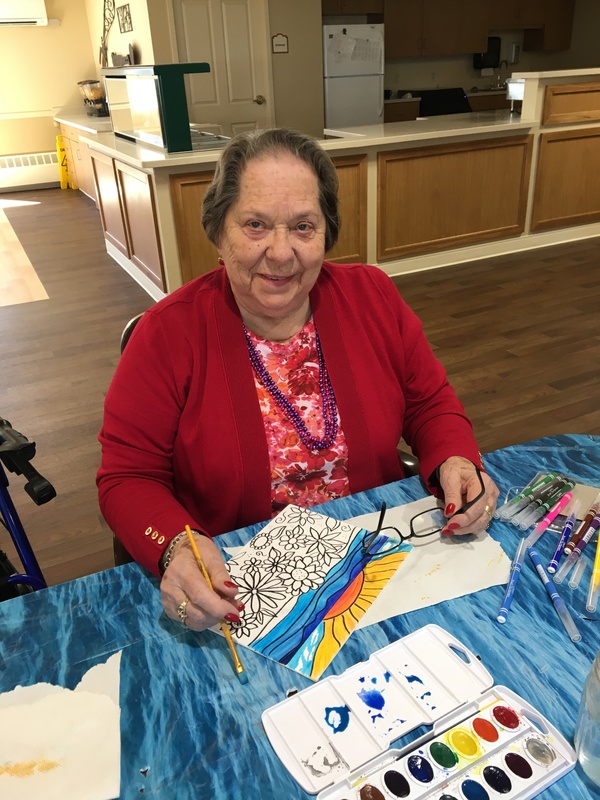 She mixes colors and adds shadows to her picture. I love that. Sweet soft-spoken Mary walks to every class without walker or wheelchair. 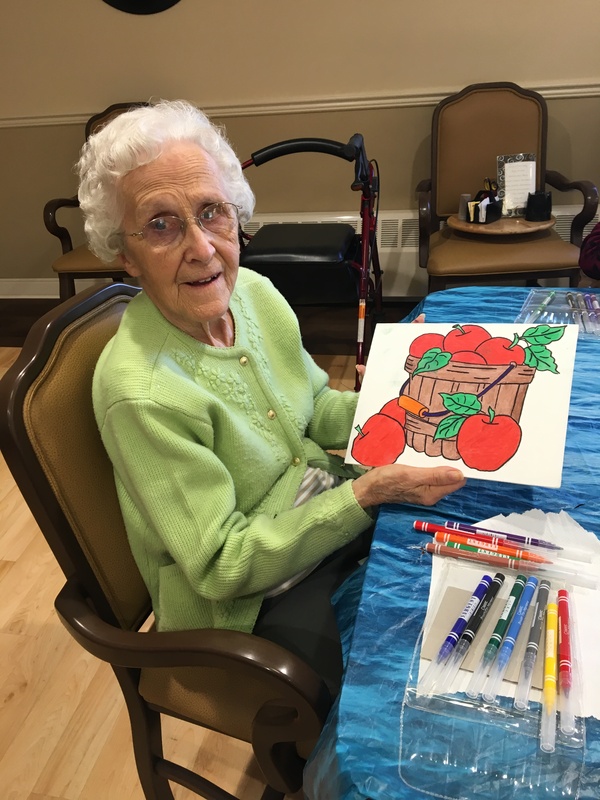 She paints simply by using 2 or 3 colors — I told her this apple basket was designed just for her because of that very reason! I don’t think Phyllis has missed a single class — and she is always the first one to arrive. Her eyesight makes her almost legally blind, and I know she struggles to see the picture at times. She is the reason I outline every picture with black marker. Big spaces. Bold lines. That’s what keeps her coming back. I have learned so much from her. Loraine also knew my mother “back in the day.” Loraine is not very confident in her art abilities, but always produces a lovely picture in the end. Her daughter has hung almost every single picture on the wall in Loraine’s room. I kinda like that. I hope you enjoyed meeting my friends and seeing their artwork. I will share more pictures and profiles of other artists next week. Please come back to meet Irene, and Hazel, and Sherry, and a few others. You’ll want to hear slices of their stories too. The Wonder Years by Leslie Leyand Fields – Book Giveaway! I love that you love, doing this Connie! I’m sure the residents just adore your presence & their projects! Such a sweet, sweet ministry you have. Hugs! This book was the inspiration! Below are a few samplings of this new hobby.